Hello again, it‘s time for another premiere on „Deborahs Bücherhimmel“ … our first novel review in English. I’ve picked one of Gary Northfield’s youth novel’s for this. During last years Frankfurt Book Fair I found „Julius Zebra“ while visiting the stand of Walker Books and now I have the pleasure to review the 3rd part of this youth novel series. After being shipwrecked on the shores of Egypt Julius is mistaken for a Horse God. Julius can’t believe his luck! He and his friends will be living preened and pampered like gods. But after a while the Egypts recognized that Julius isn’t a god and they have to fight for their life again. 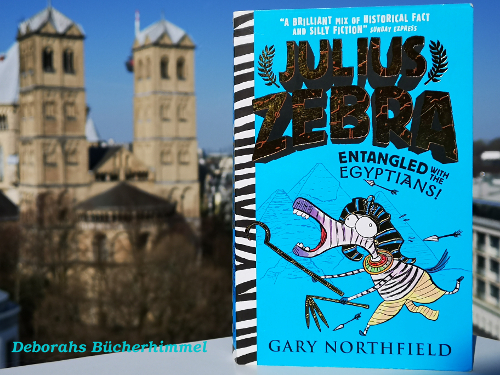 „Julius Zebra – Entangled with the Egyptians“ is the 3rd part of a youth novel series. Gary Northfield‘s series about the crazy donkey Julius and his friends are a mixture of comics and text and the illustrations are part of the story, you should read them along with the text story. I highly appreciate Gary‘s special style and the crazy mixture of historical facts and silly fiction. This story is a wild rollercoaster ride between „everything‘s fine“ and „oh oh what the heck they are doing now…“. You‘ll have lots of fun accompaning Julius and his friends on their eventful roadtrip through the ancient Egypt. And by the way you are learning a bit about the ancient Egypts and the Pharaohs. Behind the story is an overview about Hieroglyphics, Pharaohs and the worship of gods. Finally you will take part in „the art of mummification“, a small workshop with one of the story‘s protagonists. I‘ve read the english original and only a few words needed to be looked up from me as a non-native speaker. It was easy to follow the story and I had lots of fun reading it. If you‘re a non native-speaker like me with good basics of the english language I recommend to read the original English version. I will read the other parts of the series also in English. 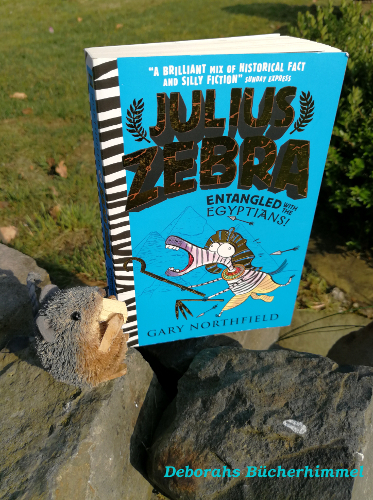 Thanks to Sara from Walker Books for this review copy of „Julius Zebra“ from Gary Northfield. „Julius Zebra“ is published by Walker Books UK. More information around this crazy funny series you can find here.